For decades, theta rhythms (∼5–10 Hz) have been thought to play a critical role in memory processing in the entorhinal–hippocampal network. However, recent evidence suggests that successful memory performance also requires coupling of ∼30–100 Hz gamma rhythms to particular phases of the theta cycle. Recent insights imply ways in which theta–gamma coupling may facilitate transfer of information throughout the entorhinal–hippocampal network. 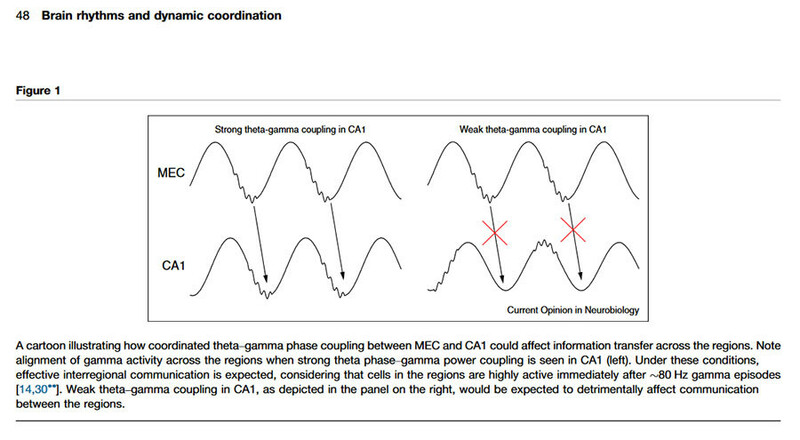 Activating gamma-modulated cell assemblies at a particular theta phase may allow the network to produce a more powerful output by ensuring that distributed cells fire closely in time. I hypothesize that such a mechanism would serve to facilitate either memory encoding or memory retrieval, depending on which type of gamma rhythms are recruited. • Theta–gamma coupling supports memory processes in the entorhinal–hippocampal network. • Theta-modulated slow gamma may promote memory retrieval. • Theta-modulated fast gamma may facilitate memory encoding.